Is there a band better suited to the 8-bit treatment than Kraftwerk? It’s hard to imagine one. The German electronic trio’s spacey, dread-infested synthscapes have been influencing DJs and other electronica-minded musicians for over 30 years, since Kraftwerk debuted in 1970. On the album 8-Bit Operators: The Music of Kraftwerk, 15 classic Kraftwerk tracks are reinterpreted by “some of the 8-bit scene’s best innovators.” It’s a match made in beep/boop heaven. The 8-Bit Operators are musicians who take pieces of lo-bit gaming technology — think the innards of the original Nintendo Operating System that create all the magic — and compose music that sounds like long-lost soundtracks to old Nintendo games. In this case, they reconceived Kraftwerk’s music in this way and, in fact, some of the best tracks on the compilation are the ones that sound the most like they belong playing behind an old game. Some of the artists on 8-Bit Operators take their task a step further. Oliver Wittchow’s “Kristallo” begins with what sounds like the sound of an old video game character moving, that bloopy, bouncy shuffle sound, mixes it with the sparkly ting of Link from “The Legend of Zelda” collecting a Rupee, loops them together with the snare of a drum machine , adds incidental touches throughout — a whoosh of a Mario jump, the high-higher-highest pitched boop-boop-boops of a power up — and makes Kraftwerk’s song his. “Kristallo” could be the soundtrack to a video game, but it works just as well as a crazy cool interpretation of a song from a crazy cool band. 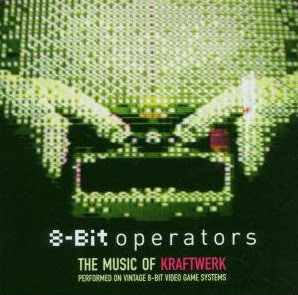 8-Bit Operators will please fans of the 8-bit sound as well as those who are into Kraftwerk. While the songs on the disc retain enough of Kraftwerk’s influence to be recognizable, the 15 artists included on the compilation admirably step up to the challenge of making music that originally sounded alien to another place altogether. Happy Feet falls into that latter category. Yet, while many of the 13 tracks are dubious (Brittany Murphy can’t replace Freddie Mercury on “Somebody to Love,” and the least said about the mash-up of Nicole Kidman singing Prince’s “Kiss” with Hugh Jackman’s interpretation of Elvis Presley’s “Heartbreak Hotel” the better), the soundtrack has enough bright spots and missed-it-by-that-much tracks to work better than it should. The brightest moment on the album is also its first, Prince’s contribution “The Song of the Heart.” While new Prince material is usually cause for celebration, this track especially stands out from his recent output. Musically, the song is, naturally, funky, but the songwriting is especially tight, tighter than other recent Prince outputs. The track sets a good tone for the rest of the soundtrack; unfortunately it’s followed by the ho-hum, typical Top 40 bait “Hit Me Up” by Gia Farrell. Of course, part of her problem is how does a new singer being groomed as the Next Pop Star follow such a legend? Prince knows what it takes to make great music; Farrell is learning. Prince has a lot of real instrumentation — actual guitars, actual horns, actual keys — on “The Song of the Heart,” generating a warm sound. Farrell, on the other hand, is overprocessed and too reliant on mechanical loops and beats, creating a cold and distant-sounding track. k.d. lang and the Patti LaBelle/Yolanda Adams/Fantasia Barrino collaboration are other stand-outs here. lang’s take on the Beatles’ “Golden Slumbers/The End” is muted yet jazzy, taking the song from the land of rock and roll statement to enchanted lullaby. LaBelle/Adams/Barrino tackle Stevie Wonder’s “I Wish,” and while no one can top Stevie Wonder, they do an admirable job turning his soul anthem into a rousing gospel roof-raiser. Of course, the addition of a choir providing back-up doesn’t hurt. The one disappointment on the Happy Feet soundtrack is Pink’s cover of Rufus and Chaka Khan’s “Tell Me Something Good.” Her voice is perfect for the song, but it sounds too overproduced and, musically, too much like the original. It’s difficult to listen to the cut, especially at the chorus, because Pink’s soaring vocals get lost in the cacophony of electronic swooshes, clicks, clacks, stomps, and background vocals. The rest of the soundtrack — including a Jason Mraz/Chrissie Hynde mash-up (two on one disc?) of Steve Miller’s “The Joker” and Bread’s “Everything I Own,” another Murphy track (two on one disc? ), “Do It Again” by the Beach Boys,” and the requisite Robin Williams tune — aren’t much to write home about. The songs might work perfectly well in the context of the movie, but on their own they’re best skipped over. 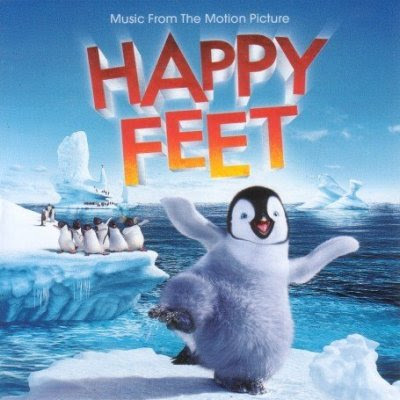 Happy Feet has some great music, but for the discerning listener the soundtrack amounts to little more than a decent EP with a lot of filler. Still, that’s a much better fate than so many other similar soundtracks clogging store shelves and little kids’ brains.